You will need about 1/2 meter each of the lining and shell fabric. The fabrics can be anything that will not be too stiff for the scarf or too uncomfortable to wear around your head and next to your skin. 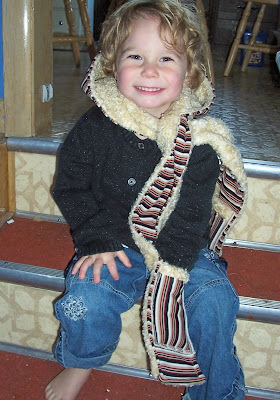 I recommend jersey knit, fleece, fun and faux fur, recycled sweaters, corduroy or flannel. There are many many possibilities. 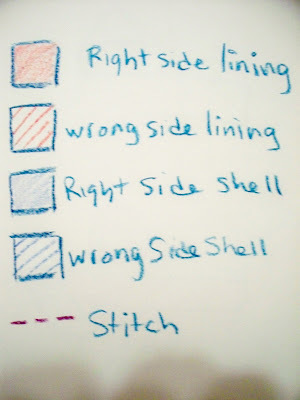 There is no reason why the lining has to be the same or different from the shell - its completely up to you. 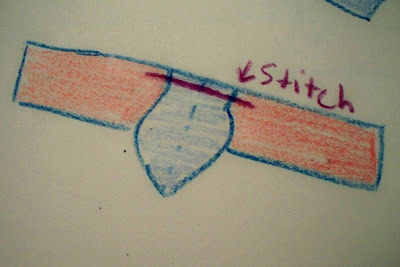 For the hoodie shape, I highly recommend strolling over to your closet and pull out your favorite hoodie and simply tracing the shape (and adding seam allowances). 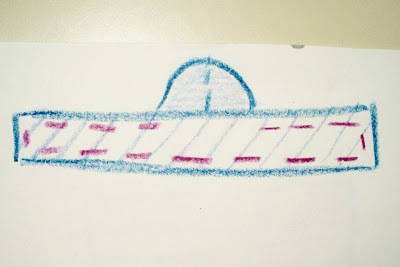 For a medium adult size, try drawing a square 15" x 12.5" (for a medium child size, try 12" x 10.5") on paper and alter it to make the right shape. These measurements include a 1/2" seam allowance. I recommend here drawing your pattern and cutting two light-weight paper pieces to tape together and try on you head. Once you've got your size and shape down, then go cut the precious fabric. Step 2: Cut scarf pieces. I have no measurements here because it is entirely personal preference. However, I find piecing together a 9 foot x 4 inch scarf to be nicely wrap-able, dangley, and comfy all at once. This is a very long scarf, though, so use your judgement. Usually the scarf must be cut in two pieces and joined together at the neck, but you may find more divisions necessary. Step 3: Sew the hood. Put 2 shell pieces of hood right sides together and sew the back. Do same for lining. This will give you your hood shape. Put shell hood and lining hood right sides together and sew up front (face opening. Turn pieces right side out and top-stitch around front to keep everything neat. I also like to stitch the neck to secure the shape. With right sides together, sew the hood to one side of your scarf. Put right sides of scarf together with the hood sandwiched between and sew seams almost all the way around, leaving a gap about a foot long. Do not sew the seam opposite of where the hood is attached. 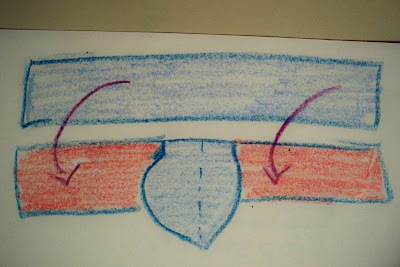 In fact, you probably will not be able to sew this section because the hood will certainly interfere. This is the part where you will pull out the scarf ends and hood. Before you sew this final part up, double check the hood area for exposed stitches or tucks and such. Last chance to neaten it all up. 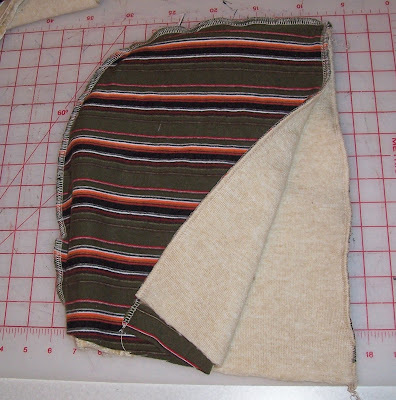 Turn scarf right sides out and top-stitch around edges closing up the final open seam. Pockets, applique, rhinestones... whatever takes your fancy. 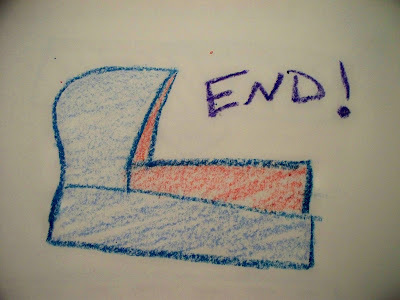 These are the pieces you should have at the beginning of step 4. Attach hood by aligning neck seam with the raw of edge of the right side of the lining scarf, with the lining material of hood face down. 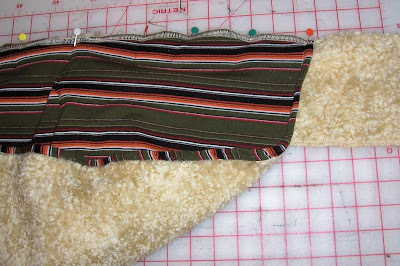 Pin and sew hood to lining scarf along the raw edge. This will look like a giant athletic cup, as my husband so wryly observed. Time to sew scarves together. 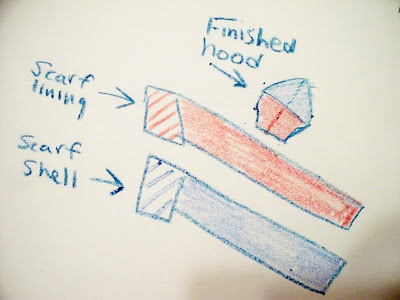 Lay the right sides of scarves together, with the hood sandwiched between. Pin and stitch around the raw edges almost all the way around to make a hoodie sandwich. 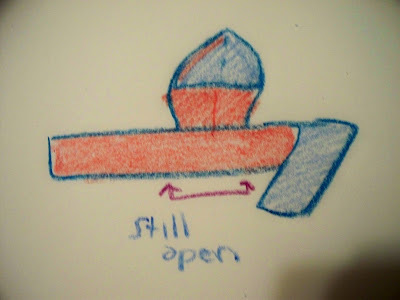 The opening is left so you can turn the scarf rightsides out. Turn scarf right sides out. The hood will pop out to rest on top of the scarf now and the seams will be nicely tucked inside of the scarf. Iron scarf neat and flat, making sure to tuck in and iron the still open side of the scarf. 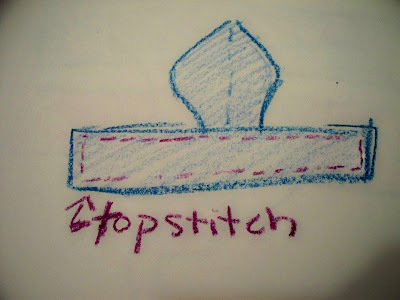 Topstitch all around the edges of the scarf to close off the opening and give it a polished look. this is so awesome. I think you should add them to your etsy store! I saw a link to this tutorial on craftster.. 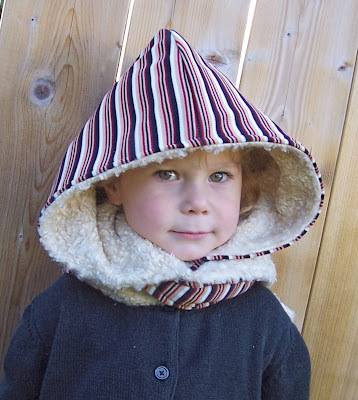 I am making one for myself, maybe with fleece inside for extra warmness. I love it! These would make the greatest Christmas presents! Thanks for sharing. Oh my gosh- I LOVE this, I'm so making one for my little girl!! Thanks for the inspiration- and your little one is SO CUTE!!! Love it! Um, when I opened the blog, I thought, "What?? Wee one has grown up so fast!" You two look SO much alike!! You are so great. I love your blog. Thanks for so much information and inspiration. 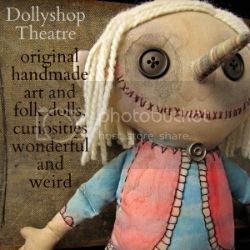 Just found these on craftster and I love them! 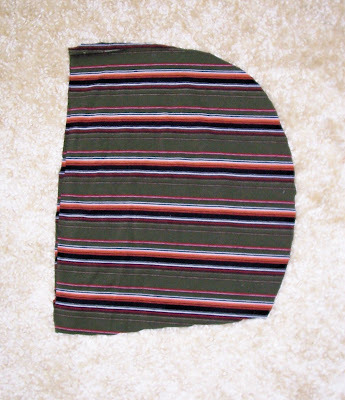 Will definitely be making some for the cold mountain winters! Thanks so much!!! I made one, with fleece. It's nice and warm, perfect for winter! Messy pic on my blog. Your tutorials rock! 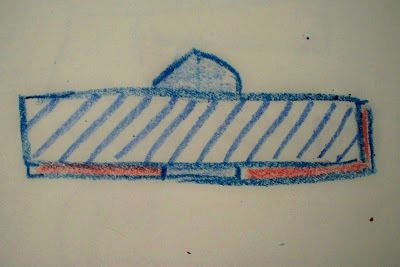 I will likely make few things on your blog. Just discovered it! Can't wait to see what have coming up next! Wow, super cute. Thank you! This is darling! So perfect for Seattle weather. I will be making one pronto. Thanks! Really nice! I need one of these now. It's just absolutely a perfect idea. i definitely wanna make one, thanks so much! yay! perfect for my sisters who are in their mid-late thirties( and SIL) and my older nieces who are 15-20!!! LOve you for this tute!! OOh this is awesome! I will definitely be making one or more of these! Thank you so much for sharing such a wonderful tute. I made 2 of these scoodies last night and I can't wait to make one for my neice. You rock! I LOVE it!Just made one for the baby and now the older 2 kids want them! That was so incredibly EASY to make! YOU ROCK! This is such a great idea! Have you looked into selling this pattern on You Can Make This dot com? 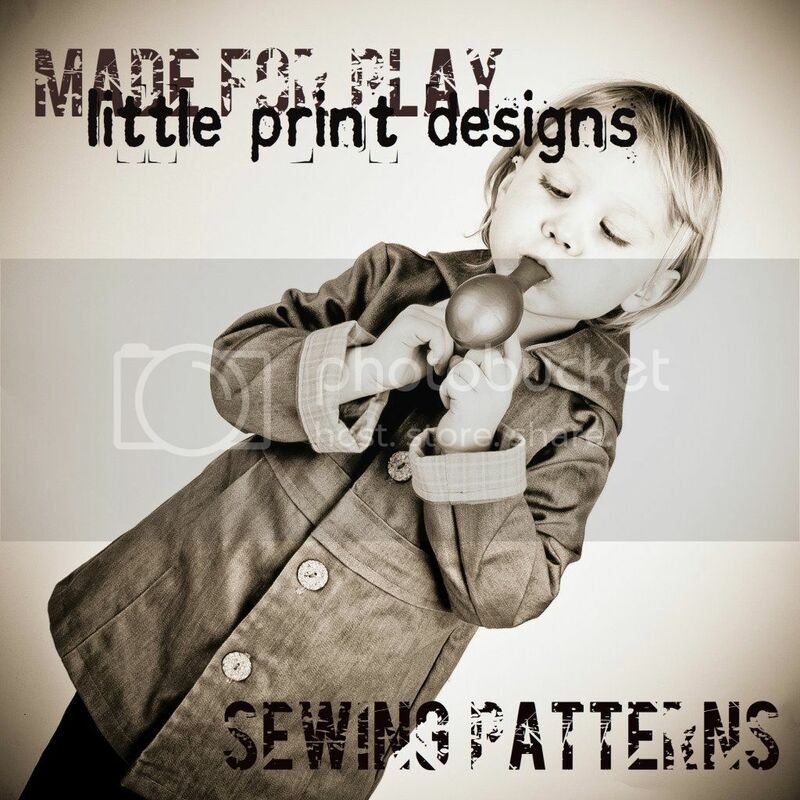 It's an e-pattern website for boutique children's items. I think the pattern would do really well there. If you go to the home page, you will find a link to contact the owner with ideas. Good luck! Anon, thanks for the idea about YouCanMakeThis.com, but I have definitively decided I like to give it up for free. My gratification comes from telling y'all what to do. I produce a show called threadheads over at Threadbanger.com. We'd like to feature this pattern in this weeks episode for all the world to see. Can we use it and of course give you credit ? Really like this idea. go for it. 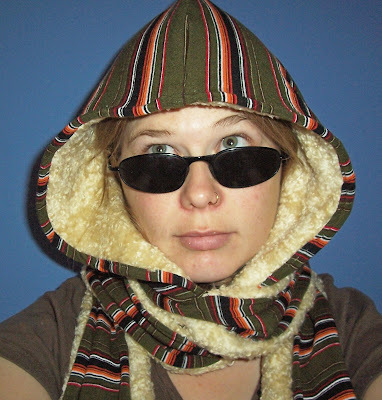 More scoodies out there, the less chance people will taunt me in the street for my fashion sense (maybe). And thanks for intro'ing me to the site - definitely a great resource. I've been dying to make this, but I couldn't figure out how. Now, thanks to you, I am making one right now. And the pockets are genius! OMG! 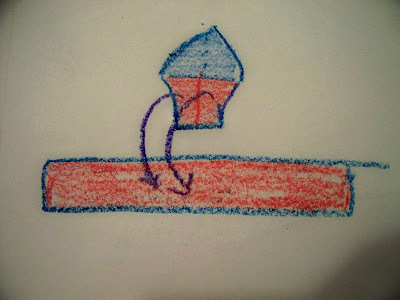 I'm going to make this tonight...there's a few bags of old sweaters I didn't know what to do with. Besides...this morning I seen some girl seeling these on ebay and thought how cool was she! thanks for adding the drawings -- NOW i get it! Thank you for sharing so generously, i understand too what it feels like to share some cool idea and your craft with others...for the past 10 years i have made most of xmas gifts and my family always says i should be selling my things, its more gratifying and fun doing it just for them and close friends...SO i made my niece a scoodie this year...from totally/only reconstructed fabric...and some new fleece...made the scarf a lil too wide...so folded it and added bottoms on the wrong side to close and keep neat...the inside of the scoodie is silk lined, for keeping hairdo in place, the outside is cordoroy and the fleece is grey...bottoms were this purple blue...everything complimented on another..and i just want you to know that i beleive what you send into the universe freely and from the heart...comes back to you tenfold...happy new year to you and your family. where should i send my pic to show you how your teaching skillz worked out. You should feel really proud..im a tute less/visual learning graduate. Woah. The "scoodie" went viral! When I began to make them 3 years ago (and christened the term "scoodie") who would have thunk it would be all over the internets! Keep on keepin' on! hahahaha "excitted" i love it! i'm going to try this out, thanks! Love it! I found your blog and just had to make one... or three. 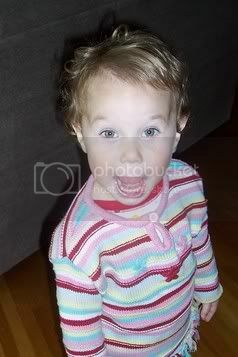 There are pics on my blog of mine if you are intersted in looking at someone elses, however yours are wonderful! I'd love to see your pics Miss Amanda but your profile is blocked. I know i'm a little behind the times but I LOVE your Scoodie!! I made one today and it's AWESOME!! =) Thanks!! Love your scoodie. Just fond you today love them have to make a few of theese soon thank you so much for pattern tutorial love it thumbs up on this one. Post it on my blog for others to come see them. This is so adorable. Was wondering, though, how hard it was to attach the shearling? (Faux shearling?) It seems like something my machine would want to eat. Ive been keeping this in my "future projects" file and finally decided to make one for my sister's birthday. I have literally just finished it and it looks absolutely fab. Thanks for sharing, and for the wonderful tutorial. Domestic House Kat, I'm so very glad it turned out! Sammy, mini scoodies? I'd love to see! Super Super cool! Ahh, I so want to go make one now! Thanks so much for the great ideas. I came across it all by accident. Love reading your blog. Thank you so much for the tutorial, these are great for us Canadians where it gets bloody cold. Very cool idea! I am definitely making these for Christmas gifts! I saved this tutorial for half a year now waiting for the winter to come... I'm going to sew 3 Scoodies for Christmas (and one for myself of course!) - with matching mittens... thanks a lot for this great idea!!! I've done it!! Now there's one in France! thank you so much!! I gonna make others for my friends. awesome Tut!!!! just finished a Hello Kitty Scoodie for a swap on Craftster :) Thanks! Thanks so much for the idea and instructions. I've already made two for xmas gifts and will be making a few more. These are awesome and easy! I have been planning on making one of these for so long now. I needed an idea for my gramma for christmas so i pulled this out. I used some fleece from my stash and thanks to your wonderful illustrations I made one. I LOVE IT. in fact, I keep putting it on. I am totally making one for myself later. thank you a hundred times. Thanks for keeping the visual learner in mind! Thank you so much for the tutorial. I've made one to send to a friend for her birthday and it can be seen here: http://community.livejournal.com/sew_hip/1963656.html. I used 1 yard each of the two different fabrics, and wish I'd made the scarf part a little longer (it's just under six feet now). Vegbee, thanks so much for sharing this tutorial (or, thanks for telling me what to do!). I made one of these for my daughter (seen here: http://www.craftster.org/forum/index.php?topic=287157.0 or on my blog). She likes it and I want one for myself! Oh this looks great! Can't wait to try it out myself! Will definitely have to make an extra to use as a prop! Thank you so much for this tutorial! I have been admiring it for ages, and finally made one... I love it sooo much, it's really cosy, stripy fleece with dalmation-spotted faux fur lining, ohh it's so lovely, and so practical, I'm not a big fan of hats. I wear it all the time... even indoors. thank you. The tutorial is so clear and easy, and it's really generous and nice of you to post it for free. When the Wow Gold wolf finally found the Buy Wow Goldhole in the chimney he crawled wow gold cheap down and KERSPLASH right into that kettle of water and that was cheap wow gold the end of his troubles with the big bad wolf. The next day the cheapest wow gold little pig invited his mother over . She said "You see it is just as mygamegoldI told you. The way to get along in the world is to do world of warcraft gold things as well as you can." Fortunately for that little pig, he buy cheap wow gold learned that lesson. And he just lived happily ever after! wow gold . LOVE it!! I have been browsing your site all day and just love everything. Should probably get housework done but I just can't pull myself away! Great winter collection. I just visited your site and found it here for winter design and all of them are really nice . Thanks for the posting. PRICELESS, thanks! Great design, excellent instructions, and a couple of good laughs to boot! I really enjoyed reading it, and am bookmarking your blog. Take care! I'd just like to concur with everybody else, you are awesome and I simply love your stuff. Thanks so much for sharing "with both hands" such a rare event in this world!!! This is such a creative idea! It makes a lovely present idea. For a beginner how long would you say it would take to make this? Pamela, depending on your fabric and scarf length, I would guessimate 1-3 hours. In other words, it can be done in one session. I love your blog! Your creativity is amazing & has inspired me to try a few of the things myself! I make handbags so I'm pretty sure I can accomplish some wonderful gifts. Thank you for sharing your talent! I love these! I finally made my first one today and my little Angelface loves it!! made this today! can't wait for winter here in New Zealand. That is one sweet scoodie! But I wouldn't wish for winter ;) There should be another stripey scoodie in New Zealand, worn by dear friend who recently moved to your beautiful country. Thanks for sharing your pic! Hello i'm french and i think your tuto is very good ! I'll try to make one for my baby and one for me. I'll come back to see your other creations your blog is beautifull congratulations !!!!! What a great post this is. thanks for the great tute! I added ears to mine! Nice review. Great design, excellent instructions, and a couple of good laughs to boot. Thank you so much! Love your blog!! These are so fun! Thanks for sharing your great tutorial. We will be featuring you on our blog, ziggycrafts.blogspot.com I love your stuff. You're very talented. I'm a hoodie-lover from a cold cold place. All those old hoodie i just cannot throw away; i guess i'll be wearing those a lot!! Thanks a lot! Theese might be found under a christmas three nearby here this year! I'll link to you if I decide to use your pattern. You, my dear, are just fabulous. I see I'm a little late to the party but this was exactly what I needed at exactly the right time. I made one tonight out of two types of fleece, large hood, 100inch scarf with pockets at the ends. It came out SO well and I've already got grand ideas for more. Thank you so much for sharing so freely!. I just made one today for a friend going through chemo. Your tutorial was so easy to follow! (I loved the illustrations, lol.) Got lucky and found one of my winter coats with a removable hood to use as a template. I'm going to make more for Christmas gifts... And one for myself of course. Haha! Thank you!!! This is going to help my bust through my TOTES of fabric, and knock off some Christmas presents in the process. Thanks for the great post with clear instructions.